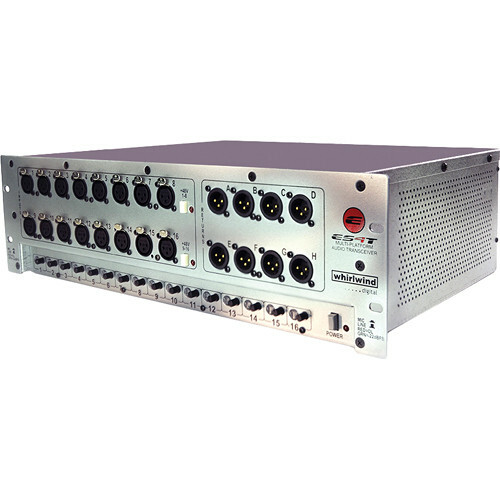 The Whirlwind ES4T Digital Snake Transmitter for Cobranet has 16 balanced mic/line inputs and 8 line level outputs. When used in conjunction with the receiver, this transmitter offers 16 channels of American made, professional quality microphone preamplification and 8 line level return channels via a choice of digital transport formats. The ES4T transmitter is configured for Cobranet format. Great performance, ease of use, and flexibility make this transmitter an apt I/O device for any digital audio network. All inputs have variable gain controls and LED level monitoring. Box Dimensions (LxWxH) 21.3 x 14.9 x 8.0"